Mouthwash can be a great tool in helping you and your child get clean teeth and gums. Different types of mouthwash have different benefits. Some benefits can include preventing tooth decay, reducing plaque. But there are just so many products on the market right now and it can be so hard to know what to look for in a mouthwash. It’s also hard to know what is safe and effective for your littles ones. We’ve taken some of the work out for you and outlined some of the things to look for when trying to find the right mouthwash. What are your dental goals? Are you looking to clear up bad breath? Do you want to reduce tooth decay? If you know what you want from a mouthwash then you’ll be better prepared to choose the right one for you and your family. Does Fluoride help? 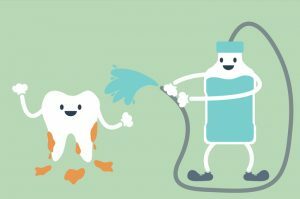 Mouthwash with fluoride is designed to reduce tooth decay and makes teeth more resistant to cavities but it doesn’t remove plaque and shouldn’t be used as a replacement for brushing or flossing. According to the dental group you can start brushing your child’s teeth with a pea shaped size of toothpaste containing fluoride between the ages of 3-6. So mouthwash with fluoride in it is okay for children as long as you follow the instructions on the bottle and ask your dentist if you have any questions. Is your mouthwash kid friendly? There are a number of mouthwashes out there that are specifically designed for children. They are usually alcohol free and come in flavors that kids enjoy. Mouthwash for kids usually helps prevent cavities. Because it contains no alcohol it is easier on the mouth than cosmetic mouthwash. As a general rule, mouthwash should not be used by children under the age of six. However, in some cases a dentist may prescribe mouthwash for a children younger than six. Does your mouthwash have the ADA seal of approval? The American Dental Association, or ADA, tests oral products for safety and effectiveness. To attain the seal of approval, a product must prove to be safe and effective. We suggest always looking for products that have the ADA seal. This will give you comfort in knowing the mouthwash you choose for your child is safe and benefits their oral health. At Hines Little Smiles we care about the questions that you may have like “Is mouthwash safe for my child?” It is important to us that you and your child are comfortable and find a pediatric dental home you can trust. Our Pediatric Dentists put kids first. We listen, educate and care about the kids. We hope you will choose Hines Little Smiles and look forward to meeting you!